Millions of children suffer from diseases and illnesses that do not have adequate treatment, and many other children are harmed by medicines intended to help them. In order to protect and help these children, society must conduct pediatric research to identify safer and more effective medical treatments. This research requires exposing some children to risks for the benefit of others. Yet, critics and courts have argued that it is unethical to expose children to research risks for the benefit of others, and this practice seems to violate our obligation to protect children from harm and exploitation. 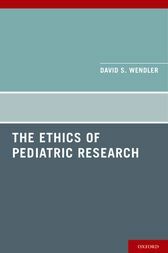 In this way, clinical research with children presents us with what appears to be an irresolvable dilemma: either we can protect pediatric subjects from exploitation, or we can protect pediatric patients from dangerous medicines, but not both.The Ethics of Pediatric Research is the first work to systematically evaluate this dilemma, and David Wendler offers an original justification for pediatric research based on an in-depth analysis of when it is in our interests to help others. It will be of interest primarily to scholars in pediatric ethics and clinical research ethics.